Background and Objective: Human T-Cell Lymphotropic Virus Type I (HTLV-I) is endemic in northeast of Iran. Although chronic inflammation of spinal cord seems to play a major role in the disease pathogenesis, immunomodulatory treatments have not shown significant improvement in disease symptoms. This study was conducted to evaluate the effect of sodium valproate in combination with Peg-Interferon (Peg-IFN) and prednizolone on proviral load and inflammatory factors of patients with HTLV-I associated myelopathy/tropical spastic paraparesis (HAM/TSP). Materials and Methods: In this pilot clinical trial, 10 HTLV-1 Associated Myelopathy/Tropical Spastic Paraparesis (HAM/TSP) patients, referred to HTLV- 1 clinic of Qaem Hospital of Mashhad, Iran in 2012, were treated with sodium valproate, Peg-IFN and prednizolone for 6 months. Peripheral blood mononuclear cells (PBMCs) were isolated using Ficoll Hypaque and the RNA was extracted from PBMCs. Complementary DNA was synthesized using TaqMan Gold RTPCR Kit. A real-time PCR TaqMan method was designed and optimized for evaluation of Rel-A, Creb and IL-1 genes expression. Results: The analysis in this study indicated that proviral load and IL-1 mRNA expression in patients were significantly lower after treatment. Despite this decline, Creb and IL-1 mRNA expression was not significant. Conclusion: The combination of sodium valproate, Peg-IFN and prednizolone seems an effective treatment for proviral load and relatively efficient for damaging inflammatory factors of HAM/TSP; however, further studies with sufficient sample sizes are necessary. This study was conducted to evaluate the effect of sodium valproate in combination with Peg- IFN and prednizolone on proviral load and inflammation factors in patients with HAM/TSP. GeneBank section of NCBI (http://www.ncbi.nlm.nih.gov) was the source used for providing the sequences of Rel-A, Creb, and IL-1 genes. Primer sequences were determined according to Table 1. 5 microliter of forward primer and 5 microliter of reverse primer related to Rel-A and Creb genes and 30 microliter of PCR product were sent to Bioneer, South Korea by Takapouzist Corporation. Table 1: Primer and probe sequences used in quantitative real-time polymerase chain reaction. Real time PCR by TaqMan method (Maser MixTaq Man, Japan) was utilized to measure expression level of Rel-A, Creb, and IL-1 genes in the samples before and after treatment. To attain the samples with the maximum expression level of Rel-A, Creb, and IL-1 genes, the reaction mixture was prepared for each gene as follows: 9 microliter of reaction mixture and 1 microliter of cDNA sample were added into each 0.1-mililiter micro-tube special for Corbett device. After adjusting the thermal conditions for the reaction, the micro-tubes were place in the Corbett device. All real time PCR experiments were conducted using Rotor Gene Q (Qiagen, Germany). Thermal cycles in TaqMan method were of two-step type. The PCR program was as follows: a) the first cycle: 95°C for 10 minutes; b) 40 to 45 cycles: 95°C for 15 seconds, 60°C for 60 seconds, and reading the green fluorescence at 60°C. Comparative analysis of gene expression was carried out by the aid of Standard Curve Method. In this method, the values of unknown sample were resulted from plotting standard curves for the desired gene and normalized using the resultant values for the desired genes. Therefore, the acceptable standard curve was depicted for target genes. After acquiring the sample concentrations, data for the desired gene was normalized using the values for the desired genes. Then the values for the desired genes were compared for the desired genes among test groups. Since the viral genome is inserted into the host genome, proviral load measurement requires DNA extraction from patient’s lymphocytes. In this study, the extraction kit Genetbio PrimePrep Genomic DNA Isolation Kit from Blood Cat. No. K-2000 was utilized. Novin Gene kit was exploited to assess proviral load level. In the kit, the occurrence frequency of TAX and LTR regions from proviral genome is divided into the albumin gene frequency against the standard curve with five defined concentrations that are commercially provided and have fixed copy numbers. Both copies of albumin gene are considered equal to one cell. The number of copies resulted are reported in the 104PBMC value. Two extraction-based calculation methods can be used in this kit: in the first method, with isolation of PBMCs from peripheral blood by ficoll; and in the second method, by the extraction of DNA from whole blood in which CBC must be done for the patient and HTLV-I titer× 100/Cell titer× (% Lymphocyte+Monocyte) formula must be applied for calculating viral load. In the present investigation, the first method was used for determination of viral load. All data were presented as mean value ± standard deviation. Alteration percent in values of Rel-A, Creb, and IL-1 genes was calculated for patients’ samples before and after treatment. Statistical analysis was conducted using SPSS 19 software. Initially Colmogrov-Smirnov statistical test was utilized to determine whether the data were parametric or non-parametric. Wilcoxon tests were used to analyze non-parametric data and for analyzing parametric data, t-test method was exploited. 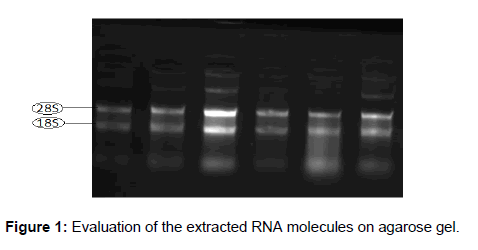 Figure 1 demonstrates an example of evaluation of the extracted RNA molecules on agarose gel that was done for all samples. 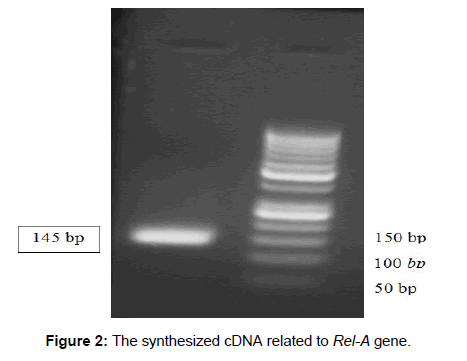 PCR reaction was conducted to examine the quality of the synthesized cDNA molecules and an example of this is represented in Figure 2. Figure 1: Evaluation of the extracted RNA molecules on agarose gel. Figure 2: The synthesized cDNA related to Rel-A gene. Age distribution of 10 studied HAM/TSP patients shows that 4 males and 6 females had the average age of 42, standard deviation was 15.9, the maximum was 62 and the minimum age was 40 [Table 2]. Table 2: Summarizes real time PCR results for Rel-A, Creb, IL-1 and HTLV-1 proviral load in samples before and after treatment. Table 2 summarizes real time PCR results for Rel-A gene in samples before and after treatment and these data have been normalized using β2-microglobolin gene. The expression of Rel-A gene before treatment with mean value of 148.6, standard deviation of 19.3, minimum expression level of 1.8 and maximum expression value of 1276 was compared to the expression of this gene after treatment with mean value of 14.63, standard deviation of 397.5, minimum expression level of 2.3 and maximum expression value of 67.3. Although the mean value for the expression of this gene has decreased after treatment, this difference was not statistically meaningful because the data were parametric (p-value=0.31). Table 2 summarizes real time PCR results for Creb gene in samples before and after treatment and these data have been normalized using β2-microglobolin gene. The expression of Creb gene before treatment with mean value of 107.3, standard deviation of 210.3, minimum expression level of 1.2 and maximum expression value of 536.4 was compared to the expression of this gene after treatment with mean value of 26, standard deviation of 25.3, minimum expression level of 0.9 and maximum expression value of 76.1. Although the mean value for the expression of this gene has decreased after treatment, this difference was not statistically meaningful because the data were parametric and paired T-test was exploited (p-value=0.22). Table 2 summarizes real time PCR results for IL-1 gene in samples before and after treatment and these data have been normalized using β2-microglobolin gene. The expression of IL-1 gene before treatment with mean value of 136, standard deviation of 226.3, minimum expression level of 0.006 and maximum expression value of 664 was compared to the expression of this gene after treatment with mean value of 15.7, standard deviation of 40.5, minimum expression level of 0.38 and maximum expression value of 130. Although the mean value for the expression of this gene has decreased after treatment; this difference was not statistically meaningful at assurance level of 95% (p-value=0.1), but because of being at assurance level of 90%, it should be investigated in a larger population. The patients’ viral load before treatment has the BMCs Copies/mean value of 1289.9, standard deviation of 546.7, the minimum value of 62, abd the maximum load of 1822. The normalization of results was carried out via Colmogrov-Smirnov statistical test and paired T-test was exploited because the data were parametric. Statistical analysis confirms that the difference between viral load before and after the treatment is meaningful (p=0.02). In comparison of viral load before and after treatment, the correlation between them was determined to be up to 0.71 [Table 2]. Monocytes play an important role in inflammatory reactions through the production of pro-inflammatory cytokines. The glial cells pay a similar inflammatory role in the central nervous system. Noting that valproate blocks the activation of NF-κB in both blood monocytes and neural glial cells, decreased expression of this protein in monocytes is extensible to glial cells. With the inhibitory effect of valproate on NF-κB, we should naturally expect the decreased expression of proinflammatory cytokines, especially IL-1, TNF-α, and IL-6. As the average expression of Rel-A gene decreased in the present study (from 148.6 to 14.6), the average expression of IL-1 gene also has decreased after treatment (from 136 to 15.7). Other investigations have proved the effect of valproate on inflammation and the cells involved in inflammation. In the present investigation that takes the benefit of interferon α combinatory treatment, the viral load shows significant depletion after the treatment (p=0.02). One reason that interferon α is known as an immunomodulator drug, is its effect on the production of other cytokines. Accordingly, an investigation eas conducted in the field of effects of type one interferon on the production of IL-1. This study determined that type one interferons strongly suppress IL-1 production. This suppression is exerted via blocking the activity of inflammasomes NLRP1 and NLRP3, which play a role in pro-IL-β maturation pathway and stimulate STAT3 via promoting IL-10 production and depletion of Pro-IL-1α and Pro-IL-1β. Also the decreased expression of IL-1 genes in this study may be caused by blocking inflammasomes. I this research combination of sodium valproate, Peg-IFN and prednizolone seems an effective treatment for proviral load and relatively efficient for damaging inflammatory factors of HAM/TSP. Vakili R, Sabet F, Aahmadi S, Boostani R, Rafatpanah H, Shamsian A, et al. AR. Human T-lymphotropic virus type I (HTLV-I) proviral load and clinical features in Iranian HAM/TSP Patients. Iran J Basic Med Sci. 2013;16:268-272. Boostani R, Saber HR, Etemadi MM. Effects of danazol on clinical improvement of patients with human T-cell lymphotropic virus type I associated myelopathy/tropical spastic paraparesis (HAM/TSP): A placebo-controlled clinical trial. Iran J Basic Med Sci. 2013;16:213-216. Rafatpanah H, Farid R, Golanbar G, Azad FJ. HTLV-I Infection: Virus structure, immune response to the virus and genetic association studies in HTLV-I-infected individuals. Iran J Allergy Asthma Immunol. 2006;5:153-166. Taghaddosi M, Rezaee SAR, Rafatpanah H, Rajaei T, Farid Hosseini R, Valizadeh N. Association between HLA class I alleles and proviral load in HTLV-I associated myelopathy/tropical spastic paraperesis (HAM/TSP) patients in Iranian population. Iran J Basic Med Sci. 2013;16:264-267. Shirdel A, Azarpazhooh MR, Sahebari M, Ghanbari M, Mirfeizi Z, Hutchinson I, et al. Association of IL-10 gene polymorphisms and human T lymphotropic virus type I-associated myelopathy/tropical spastic paraparesis in North-East Iran (Mashhad). Iran J Basic Med Sci. 2013;16:258-263. Pillat MM, Bauer ME, Penalva de Oliveira AC, Ulrich H, Casseb J. HTLV-1-Associated myelopathy/tropical spastic paraparesis (HAM/TSP): Still an obscure disease. Cent Nerv Syst Agents Med Chem. 2011;11:1-7. Shoeibi A, Etemadi MM, Moghaddam AA, Amini M, Boostani R. “HTLV-I Infection” Twenty-year research in neurology department of Mashhad University of Medical Sciences. Iran J Basic Med Sci. 2013;16:202-207. Rafatpanah H, Hedayati-Moghaddam MR, Fathimoghadam F, Bidkhori HR, Shamsian SK, Ahmadi S, et al. High prevalence of HTLV-1 infection in Mashhad, Northeast Iran: a population-based seroepidemiology survey. J Clin Virol. 2011;52:172-176. Matsuzaki T, Nakagawa M, Nagai M, Usuku K, Higuchi I, Arimura K, et al. HTLV-I proviral load correlates with progression of motor disability in HAM/TSP: Analysis of 239 HAM/TSP patients including 64 patients followed up for 10 years. J Neurovirol. 2001;7:228-234. Boostani R, Vakili R, Hosseiny SS, Shoeibi A, Fazeli B, Etemadi MM, et al. Triple therapy with prednisolone, pegylated interferon and sodium valproate improves clinical outcome and reduces human T-cell leukemia virus type 1 (HTLV-1) proviral load, tax and HBZ mRNA expression in patients with HTLV-1-associated myelopathy/tropical spastic paraparesis. Neurotherapeutics. 2015;12:887-895. Rafatpanah H, Rezaee A, Etemadi MM, Hosseini RF, Khorram B, Afsahr L, et al. The impact of interferon-alpha treatment on clinical and immunovirological aspects of HTLV-1-associated myelopathy in northeast of Iran. J Neuroimmunol. 2012;250:87-93. Saifi B, Rezaee SA, Tajik N, Ahmadpour ME, Ashrafi M, Vakili R, et al. Th17 cells and related cytokines in unexplained recurrent spontaneous miscarriage at the implantation window. Reprod Biomed Online. 2014;29:481-489. Lezin A, Gillet N, Olindo S, Signate A, Grandvaux N, Verlaeten O, et al. Histone deacetylase–mediated transcriptional activation reduces proviral loads in HTLV-1–associated myelopathy/tropical spastic paraparesis patients. Blood: 2007;110:3722-3728. Fujiwara K, Yoshida A, Ochi M, Yoshioka H. Serum immunoglobulin levels in children receiving valproic acid Brain Dev. 1983;5:193. Joubert P, Aucamp A, Potgieter G, Verster F. Epilepsy and IgA deficiency--The effect of sodium valproate. S Afr Med J. 1977;52:642-644. Castelo-Branco G, Stridh P, Guerreiro-Cacais AO, Adzemovic MZ, Falcao AM, Marta M, et al. Acute treatment with valproic acid and l-thyroxine ameliorates clinical signs of experimental autoimmune encephalomyelitis and prevents brain pathology in DA rats. Neurobiol Dis. 2014;7:220-233. Cardinale JP, Sriramula S, Pariaut R, Guggilam A, Mariappan N, Elks CM, et al. HDAC inhibition attenuates inflammatory, hypertrophic, and hypertensive responses in spontaneously hypertensive rats. Hypertens. 2010;56:437-444. Belrose G, Gross A, Olindo S, Lezin A, Dueymes M, Komla-Soukha I, et al. Effects of valproate on Tax and HBZ expression in HTLV-1 and HAM/TSP T lymphocytes. Blood. 2011;118:2483-2491. Lemasson I, Lewis MR, Polakowski N, Hivin P, Cavanagh MH, Thebault S, et al. Human T-cell leukemia virus type 1 (HTLV-1) bZIP protein interactswith the cellular transcription factor CREB to inhibit HTLV-1 transcription. J virol. 2007;81:1543-1553. Afonso PV, Mekaouche M, Mortreux F, Toulza F, Moriceau A, Wattel E, et al. Highly active antiretroviral treatment against STLV-1 infection combining reverse transcriptase and HDAC inhibitors. Blood. 2010;116:3802-3808. Olindo S, Belrose G, Gillet N, Rodriguez S, Boxus M, Verlaeten O, etal. 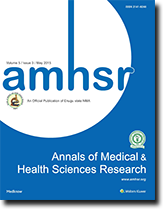 Safety of long-term treatment of HAM/TSP patients with valproic acid. Blood. 2011;118:6306-6309. Nakamura T, Shibayama K, Nagasato K, Matsuo H, Tsujihata M, Nagataki S. The efficacy of interferon-alpha treatment in human T-lymphotropic virus type-I-associatedmyelopathy. Jpn j med. 1990;29:362-367. Shibayama K, Nakamura T, Nagasato K, Shirabe S, Tsujihata M, Nagataki S. Interferon-alpha treatment in HTLV-I-associated myelopathy: studies of clinical and immunological aspects. J Neurol Sci. 1991;106:186-192. Feng J, Misu T, Fujihara K, Saito H, Takahashi T, Kohnosu T, et al. Interferon-α significantly reduces cerebrospinal fluid CD4 cell subsets in HAM/TSP. J Neuroimmunol. 2003;141:170-173. Feng J, Misu T, Fujihara K, Misawa N, Koyanagi Y, Shiga Y, et al. Th1/Th2 balance and HTLV-I proviral load in HAM/TSP patients treated with interferon-α. J Neuroimmunol. 2004;151:189-194. Saito M, Nakagawa M, Kaseda S, Matsuzaki T, Jonosono M, Eiraku N, et al. Decreased human T lymphotropic virus type I (HTLV-I) provirus load and alteration in T cell phenotype after interferon-α therapy for HTLV-I–associated myelopathy/tropical spastic paraparesis. J Infect Dis. 2004;189:29-40. Nakagawa M, Nakahara K, Maruyama Y, Kawabata M, Higuchi I, Kubota H, et al. Therapeutic trials in 200 patients with HTLV-Iassociated myelopathy/tropical spastic paraparesis. J neurovirol: 1996;2:345-355. Guarda G, Braun M, Staehli F, Tardivel A, Mattmann C, Förster I, et al. Type I interferon inhibits interleukin-1 production and inflammasome activation. Immun. 2011;34:213-223. Araujo AdQ-C, Afonso CR, Leite ACB, Dultra SV. Intravenous methylprednisolone in HTLV-I associated myelopathy/tropical spastic paraparesis (HAM/TSP). Arq Neuropsiquiatr. 1993;51:325. Karimooy HN, Derakhshan M, Rezaee SA, Hosseini M. Prednisolone as a new approach for treatment of HTLV-1 associated polyneuropathy. Pakistan Journal of Medical Sciences. 2009;25:142-145. Airla N, Luomala M, Elovaara I, Kettunen E, Knuutila S, Lehtimäki T. Suppression of immune system genes by methylprednisolone in exacerbations of multiple sclerosis. J Neurol. 2004;251:1215-1219. Meduri GU, Tolley EA, Chrousos GP, Stentz F. Prolonged methylprednisolone treatment suppresses systemic inflammation in patients with unresolving acute respiratory distress syndrome: evidence for inadequate endogenous glucocorticoid secretion and inflammation-induced immune cell resistance to glucocorticoids. Am J Respir Crit Care Med. 2002;165:983-991. Scheinman RI, Cogswell PC, Lofquist AK, Baldwin AS. Role of transcriptional activation of IκBα in mediation of immunosuppression by glucocorticoids. Sci: 1995; 270: 283-6. Auphan N, Di Donato JA, Rosette C, Helmberg A, Karin M. Immunosuppression by glucocorticoids: inhibition of NF-κB activity through induction of IκB synthesis. Sci. 1995;270:286-290. Eggert M, Goertsches R, Seeck U, Dilk S, Neeck G, Zettl UK. Changes in the activation level of NF-kappa B in lymphocytes of MS patients during glucocorticoid pulse therapy. J Neurolog Sci. 2008;264:145-150.